The BLM uses freeze marking to identify captured wild horses and burros. Freeze marking is a permanent, unalterable and painless way to identify each horse as an individual. It is applied on the left side of the neck. 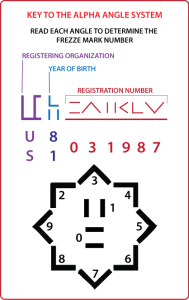 It utilizes the International Alpha Angle System, which uses a series of angles, and alpha-symbols that cannot be altered. 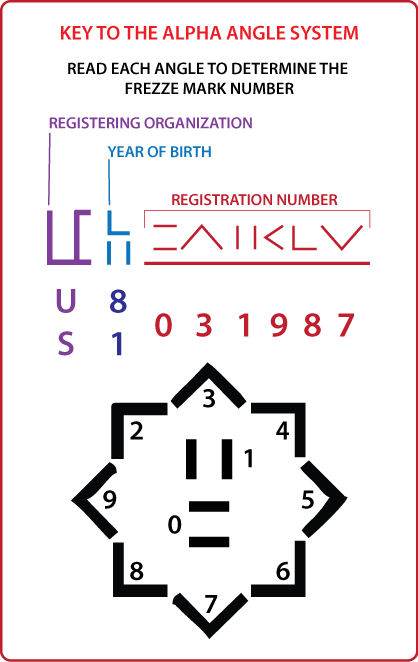 The mark contains the Registering Organization (U.S. Government), year of birth, and registration number. In addition to the freeze mark on the left side of the neck, sanctuary wild horses are marked on the left croup with 4 inch high Arabic numerals that correspond with the last four digits of the freeze mark on the neck. Although every effort is made to apply freeze marks which are legible, occasionally freeze marks do get blurred. This happens when the iron is applied, the animal moves and all or some of the identification number cannot be read. The following graph illustrates how to read a freeze mark. If a mark is difficult to read, we recommend shaving the left side of the neck. You must know the freeze mark of your horse or burro before you make an inquiry to a BLM office.